← Abolish Prisons. Can You Think of Such a Thing? The East Bay Solidarity Network has released Evict This! a handbook on the history of housing in West Oakland and tools to resist displacement. The burst of the “housing bubble” in 2008 began a process of siphoning the hard earned wealth of families of color into the hands of the wealthy white shareholders of banks and investments firms that hold mortgages. Middle and working class white families were, of course, also affected by the crisis, but black and brown homeowners were disproportionately affected. This is not a new phenomenon in the history of the U.S. Evict This! gives details on how this played out in Oakland. Below is a short excerpt from the handbook. You can download the entire work here. Oakland is one city in a nationwide foreclosure crisis that is stealing the wealth out of communities of color. 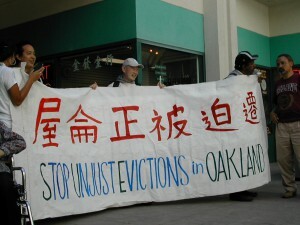 Ninety-three percent of the foreclosed homes purchased by investors in Oakland were in low-income neighborhoods. Nationally, 17% of Latino homeowners and 11% of Black homeowners have already lost or are at imminent risk of losing their homes. This is compared with 7% for white homeowners. Studies even show that people of color with the same income as whites are losing their homes at a much faster rate. Systemic racism is clearly at work. Communities of color have been unfairly hurt by the foreclosure crisis and there is no guarantee, especially from the government, of any help returning their wealth. According to a study by the Alliance for a Just Society, “The most devastating impacts of the ongoing foreclosure crisis were in majority people of color communities: Zip codes with majority people of color populations saw an average of $2,198 in lost wealth per household, over 1.7 times the average lost wealth in majority white zip codes.